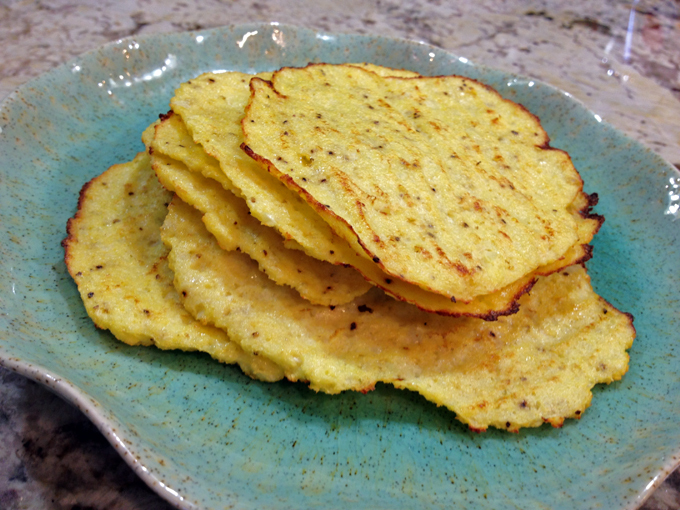 CAULIFLOWER TORTILLAS: GOING LOW CARB AND LOVING IT! You’ve got to admit I did a pretty good job on my promise to stop posting so many cauliflower recipes. It’s been more than 2 months since I brought up Brassica oleracea to your screen. I cannot hold myself back anymore, not when I made these A-M-A-Z-I-N-G “caulitillas” that even the husband professed to be delicious. That is saying a lot, as he is adamant about corn tortillas, preferably the yellow kind. But, ever since Iron Man Mike blogged on these babies I’ve been meaning to try them. They are everything he told them to be. Make these. It is a little involved, but in a fun way. And the pay off is huge. Heat oven to 375°F (190°C), line two baking sheets with parchment paper and grease them with olive oil. In a food processor rice the cauliflower, until you get a texture finer than rice. Measure to make sure you have 3 cups of the riced veggie. Place cauliflower rice in a bowl and microwave on high for 2 minutes, give it a stir and microwave for another 2 minutes. Place the cauliflower rice in a tea towel and twist it to squeeze as much moisture as you can. Do not skip this step, because the cauliflower must be dry to behave properly in the subsequent stages of cooking. 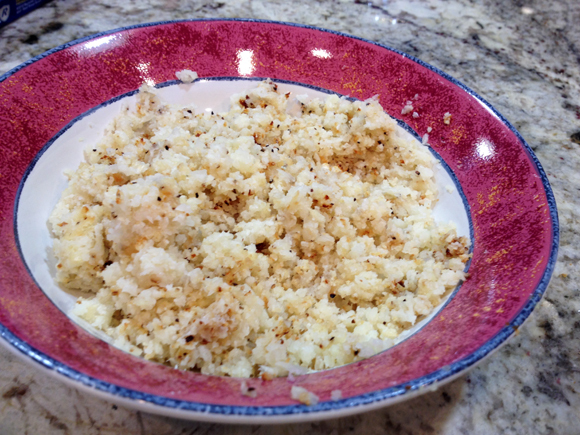 Place drained cauliflower rice back in the bowl and add eggs, salt and pepper and mix until combined. Spread the mixture onto the lined baking sheets into 8 fairly flat circles. A small offset spatula works wonders here. Place in the oven for 10 minutes, then peel them off the parchment paper, flip them and bake for further 6 to 7 minutes. Heat a nonstick medium-sized pan over medium heat and place the tortillas into the pan pressing down slightly and brown them (1 minute per side). Hard to find someone who loves a Mexican meal more than I do. Tacos, tostadas, enchiladas, I love them all! But, as the years go by, it gets easier for carbs to turn into fat, so I love it when I find a lighter way to indulge in one of my favorite cuisines. 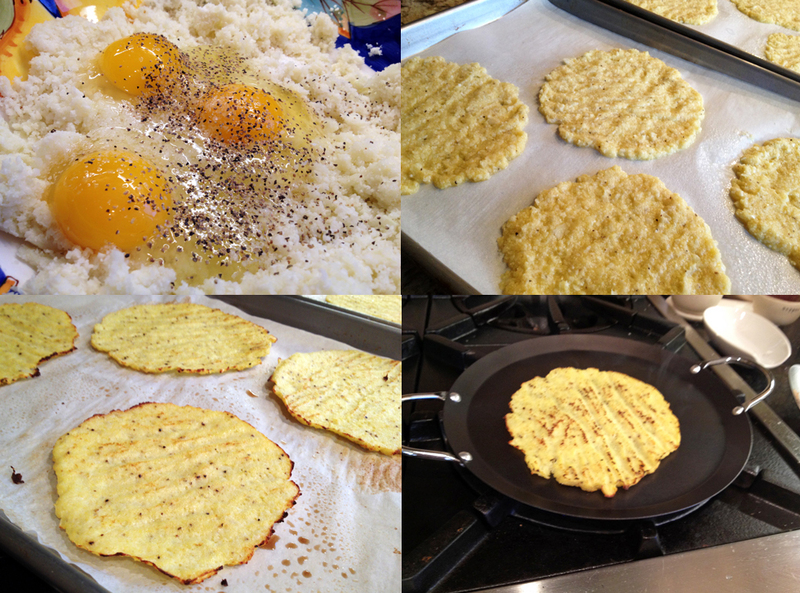 The Paleo world offers quite a few lower-carb options for tortillas using tapioca and/or coconut flour mixed with eggs, and cooked on a non-stick skillet. They can be quite tasty, but their texture is closer to that of a crepe. If you are searching for a wrap that will be closer to the real thing, look no further. They even look like corn tortillas, don’t you think? We had some tortillas leftover and I enjoyed them two days in a row, without any detectable loss in flavor or texture. I advise you to bake the full batch, and then do the final browning on top of the stove only for those you intend to consume right away. Store the rest in the fridge, well wrapped. The “caulitillas“, paired with pulled pork and a few selected toppings made for a fantastic midweek dinner! Next time I intend to use them in chicken enchiladas, like those from Mike’s original post. Scrumptious! And, don’t forget that if your cauliflower produced more than the three cups of riced veggie needed for this recipe, put the additional amount to good use: make a batch of roasted riced cauliflower with coconut oil, and save it as a tasty side dish for later. Sally, I used the caulitillas to make that chicken enchilada casserole, and it was awesome! I did change up the sauce and used Rick Bayliss’ essential simmered enchilada sauce, rather than the one in the recipe. LOVE IT!!!!!!!!!! Love love love!!! 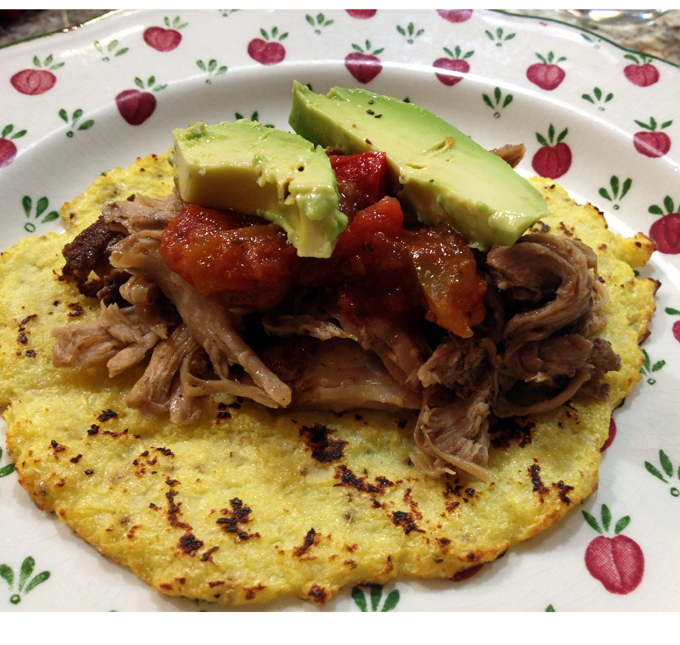 Many takes on lower carb tortillas are around, but I think it will be hard to beat this one! Sounds like I need to try them! I am sure you will love them! These look and sound amazing! Yummers! You got me here. I’m going to make them. I have been going both cauliflower crazy and low carb these days. Although this looks a little involved at the same time it’s seems very simple. Glad you posted it! If you hadn’t told me what these were made of, I would never have guessed. Clever woman! The best part of Mexican food is the filling anyway, so you might as well cut carb corners where you can! These sound great! That is true! The filling is where all the joy lives! SO just walked in and saw the picture and said ‘Oh! We gotta make those!” So in the “to do” notebook it goes. You are just the best blogger. Blogging is hard. Not just the amount of time it must take but also hitting that narrow lane of “just right”. Your content is so varied. The site organization is exactly right. There are just enough pictures and concise instructions with good first hand advice and observation. I am not one to read blogs very often but yours I check on frequently. Thank you for all of the good recipes, advice and enjoyment I have been getting here. Oh my… I must say comments like the one you left make me gain a ton of energy to keep blogging, I cannot stop smiling! Sally, these look SO good! I am all over cauliflower rice and this seems like the logical & delicious next step. Yes, I am also fond of all sorts of creative twists with cauliflower – so light! OMG, I’ve got to make those babies asap! A fantastic idea. Hope you try them, Rosa! One of the first recipes I developed for ATK was a cauliflower dish, I’ve been up to my eyeballs in the stuff for about a month! This looks fascinating. Are they pliable? I can’t wait to try them! !